What is a balloon twister? A balloon twister or balloon artist creatively shapes balloons into unique designs and characters such as animals, hats, flowers, and more. Balloon twisters are a fun and entertaining addition to nearly any event! How much does it cost to hire a balloon twister? On average, balloon twisters charge $100-$200 per hour. Prices can vary based on any travel fees and the number of children at the event. How many balloons can an artist twist per hour? The number of balloons that can be twisted per hour really depends on the complexity of the shapes being requested. Many balloon twisters can do 10-15 custom shapes per hour or about 25 per hour for simpler, pre-approved shapes. If you’re planning a large event, you may want to book more than one balloon twister to ensure everyone gets a balloon. What kind of designs can a balloon twister make? A balloon twister can shape balloons into almost anything! The most common designs are animals but there are countless possibilities. Balloon twisters love to get creative and can even make custom designs that fit your event’s theme. Other than birthday parties, what other kinds of events are appropriate for a balloon twister? Balloon twisters can be a great addition to festivals, community events, holiday parties, and family-friendly corporate events. The large variety of designs that they can offer make them great with different age groups. Due to the limited amount of equipment needed, they are also very flexible in regard to the performance space. How far will a balloon twister travel? Each balloon twister sets their own travel preference. You’ll want to ask them directly prior to booking to discuss their ability to travel to your event as well as any associated travel fees. Here at Katrina’s Party Characters We travel up to an hour away from Hollywood/Downtown Los Angeles with no travel fee. Ever been in a bind like this? -It’s the last minute, and suddenly you realize that you forgot to hire a magician for your event. Not to worry, here are a few helpful hints for hiring a professional magician in Los Angeles for your party or corporate event. Most magicians for hire, at least here in Los Angeles, have five star Yelp ratings. I think that’s because it’s such a face to face experience when you hire a performer. Frankly it’s a mystery to me, because I can’t tell you how many awful magicians I know who have a five star Yelp rating. Some of them actually give invitations to the Magic Castle in exchange for five star reviews. Tacky. When you look at a magician’s photos and website, use your intuition. It may be more accurate than Yelp. When it comes to working st the Magic Castle and peer magician accolades, I’d say take them all with a grain of salt. As someone who frequents the Castle and Magic communityI can tell you that they don’t really matter that much. It certainly doesn’t hurt if a performer has some awards to brag about, but it doesn’t NECESSARILY mean they are actually good. They may be great at slight of ha d and terrible at performing or not funny or interesting at all! Trust me on this. If the magician has a publicly ticketed show, that’s a good sign. Go see it, or, at least read the reviews. 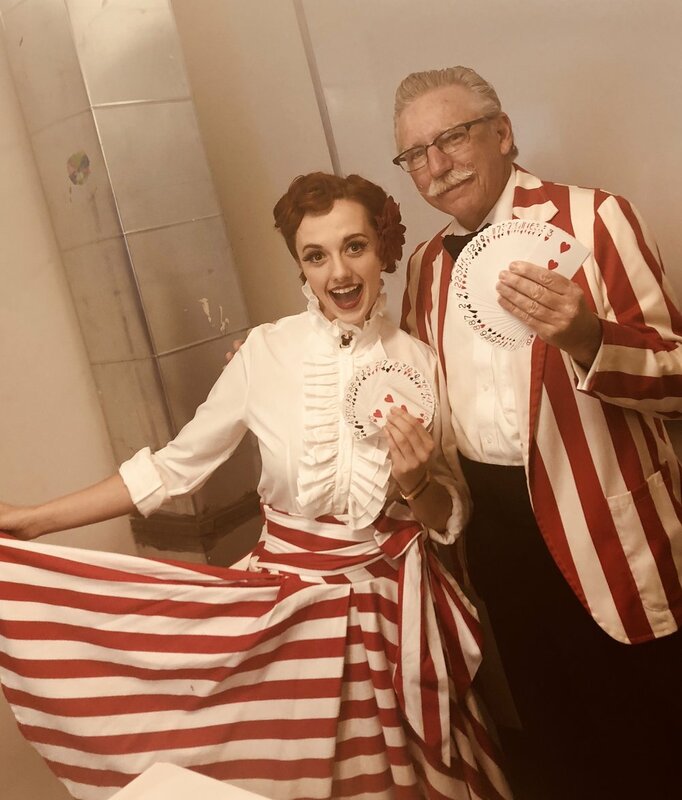 It’s much harder for someone to “game” Yelp or Tripadvisor when they are literally performing for hundreds of paid attendees each year who then proceed to leave honest reviews about the magic show they just saw. And, the mere fact that a magician HAS thousands of paid attendees each year is also a very positive sign. Looking into booking the best Los Angeles magician or best Bay Area magician? Well I have news for you! If you're expecting the old rabbit-out-of-a-hat trick or sawing a woman in half: this is not your grandfather's magic. Professional magicians have updated their magic shows with amazing illusions, dangerous stunts, mentalism, comedy, and more! People of all ages alike are amazed by magical entertainment, and magicians know how to read their audience. Whether you're planning a corporate event, school prom, or a fun birthday party, book a Los Angeles magician or a San Francisco magician through Katrina’s Party Characters to provide the mystery and awe at your next magical event! If you've decided to book a magician for your party or event, you're in for quite a show! With illusions, games, and comedy, guests of all ages will be dazzled and remember this celebration for years to come. The cost of hiring a professional magician will vary depending on the type of show, length of performance, the age range of the audience, and the entertainer’s experience. Prices may also increase for more elaborate shows with various props and equipment for complex illusions. Contact local Los Angeles or San Francisco magicians Dirrctly to get a quote for your event. If you’re unsure what to do you can always send Katrina’s Party Characters a quote! When booking a professional magician, consider the differences between the many genres of magical entertainment. Some professionals specialize in kids parties with family-friendly comedy and illusions. Other magicians push physical boundaries with bold escape tricks and dangerous props. Strolling magic, also known as table magic, is suitable for smaller, more intimate audiences and can provide excellent dinner entertainment. It may be difficult to decide, but browsing through online profiles and websites will give you a detailed look into each magician's performance. Look for a description of their services, photos of their act, and if possible, read through reviews from their past clients on yelp, gig websites, and google maps. When you book a professional magician on A random gig website you never know what you’re going to get. Here at Katrina’s Party Characters we alwyas tecommend yu book directly with the magicians themselves. It will save you tons of overhead and extra fees those indirect gig sites charge to you and to the performer . Never fear! If you book through Katrina’s Party Characters then you can rest easy knowing your communication and payments are secure, and you're backed by our KPC Worry-Free Guarantee. You'll have a memorable and magical event! Katrina is a children’s magician and close up magician that performs in San Francisco, the Bay Area, Las Vegas, Los Angeles, Hollywood, Santa Monica, Malibu, Beverly Hills, Hollywood and more!